Xiaomi Hints Arrival of Mi MIX 3 Special Edition with Artistic Appeal - Playfuldroid! 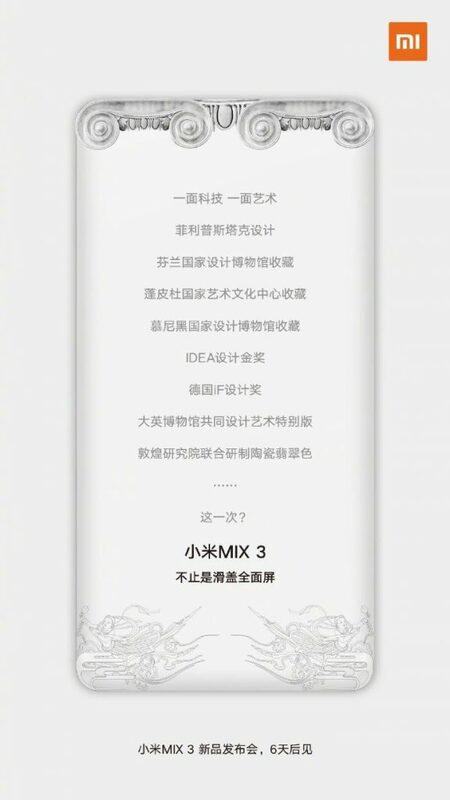 Xiaomi has released a new teaser on its Weibo account to hint that it will be launching a special version of the upcoming Mi MIX 3. It seems to be some sort of artistic edition as the Chinese manufacturer has collaborated with British Museum to design it. The handset will be sporting ceramic white color. The above teaser does not reveal any information on the specifications of the special edition Mi MIX 3. The handset is expected to arrive with up to 8 GB of RAM and up to 256 GB of storage. It will be fueled by Snapdragon 845 chipset. Xiaomi has also confirmed that the Mi MIX 3 will include 10 GB of RAM and 5G connection support. Recent reports have revealed that the slider of the Mi MIX 3 will be equipped with dual front-facing cameras with 24-megapixel main sensor and LED flash. It will be also arriving with an in-screen fingerprint reader. A recently leaked image of the Mi MIX 3 has revealed that it will be offering a very high screen space of around 95 percent. The display of the phone is expected to carry support for Full HD+ resolution of 1080 x 2340 pixels. Rumors have it that it may arrive with 13-megapixel + 16-megapixel dual camera setup.